We have no idea who is singing the song above, but we probably stepped on his toes four years ago. Sorry, man. A friend from grade school had grown up to work in the White House, and knew a few people in Obama’s campaign. He got two tickets to the swearing-in and offered me one. The two tickets were not the same. Entrance to the inauguration was color-coded. A ticket’s border indicated which entrance to use. My connection’s seat was close up, on the side of the capitol steps facing the House of Representatives. Mine was further back on the other side, the Senate side. At that entrance, the waiting crowd had to fit in a pinched intersection. To avoid a scene, police had created an overflow line that dipped down to the innocuous tunnel. Unfortunately, some communication got botched, and when the time came to let us in to the ceremony, no one opened our gate. The purple ticket gate. Then no one came to open it. Then no one did anything at all, except wait for someone else to make a decision. An hour passed. Then two. Rumors spread that we were moving, then not. They were credible enough to keep everyone from just going home. Some entrepreneurial types came through with hand warmers of the type skiers and hunters carry. They were bags of chemicals that you shake until they heat up, lasting maybe 15 minutes. To everyone&apos;s credit, no one gouged on prices. The hour for the swearing in-approached. We had been standing in an underground tunnel for four hours, in January. No one’s feet worked. My hands didn’t work. I kept dropping my ticket. It was no colder than any cold East Coast day, but the sense of a broken promise was frustrating, which made the cold feel colder. With a half-hour to spare, I decided to walk out of the tunnel and toward the gate. At the gate, everyone was crushed together. I was alone, so could make progress; people holding hands were not going anywhere. I got to the gate. I had made it just in time! The cop looked at my ticket, shrugged, and said he didn’t know what to do, and he was sorry. Game over. A moment later, an antique cannon fired a few yards across a glen, on the capitol grounds, and the ceremony began. The huge PA speakers for the inaugural faced toward the president. Behind them, none of us who had picked our way to the mouth of the tunnel could hear the address. The police there began to get tetchy, and the crowd got frustrated. A lot of people had come from a long distance to attend. I walked away from the gate for safety; I didn’t want to be pressed against the chain link fence set up around the closed gate, if the few thousand people behind me started to push harder. A block away, I found some sun,and sat down on the sidewalk, figuring I would at least try to warm up. Ten yards away, perhaps twelve, a man in his fifties stood up and started yelling. It was worrisome. Frustration had peaked. He was roundish, with a fanny pack and a puffy winter coat—if anyone has ever dressed more like a tourist in DC, I can’t say I’ve seen it. A few of us decided to go calm him down. Closer, he was yelling in curious cadences. He had a wire in his ear that would have suggested the Secret Service, were he not so out of shape. A radio. It took a second to realize what he was shouting; none of us, after all, knew what Obama had planned to say. In the year of America&apos;s birth, in the coldest of months, a small band of patriots huddled by dying campfires on the shores of an icy river. Later, some people with him explained he was a lay preacher from North Carolina. The guy was about a sentence behind Obama, I’d guess, and the Southern pulpit rhythm was not an act. Frozen and bloodied! Nothing but hope! If the guy was a Revolutionary War reenactment type, it would make sense. I didn’t ask. So the crowd started to lean toward this guy, then surrounded him, and listened to the whole thing via ventriloquism. Everyone went to pieces. It’s amazing what four hours in a cold tunnel will do to one’s sense of irony. The preacher’s voice rose a decibel every line or two, full of brio. By the end, our little frozen band was at an emotional pitch I associate with the U.S. hockey team beating the Soviets at Lake Placid. Years later, I think that moment worked because it was so perfectly snotty in its way. Offended entitlement—but we have tickets!—and flash community, in perfect balance. 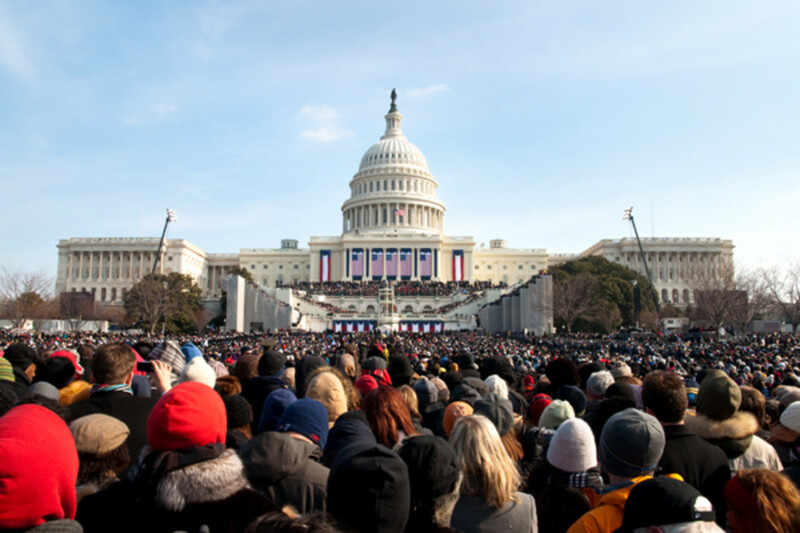 This year, according to predictions, inauguration day is expected to be warmer. Was Chávez's Political Base What It Seemed?